Spraying cherry trees in spring will aid in preventing certain insects and disease from damaging the fruit harvest later in the year. 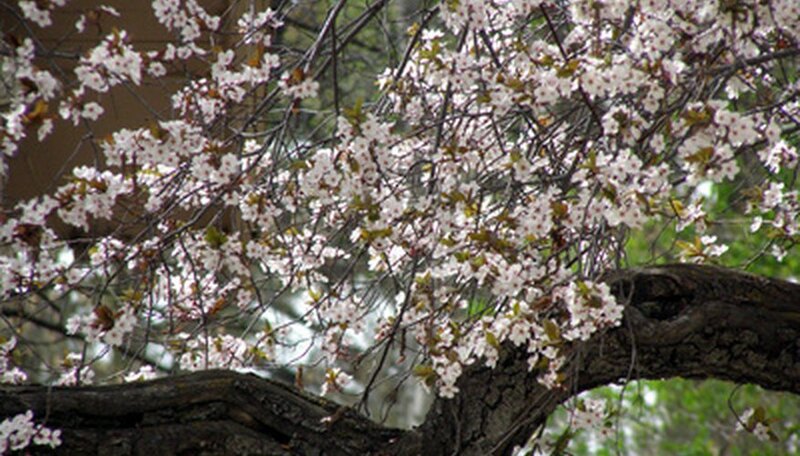 There are various insects and molds that can affect cherry trees and blooms in early spring. While inspection is the most prudent, a spray schedule may have to be completed in order to keep ahead of insect and pest problems. According to the University of Illinois, insecticides must never be sprayed on the trees in full bloom; they will kill pollinating insects such as bees. Apply a dormant oil or a copper compound spray to the tree in late winter to early spring. This application must be before any swelling of the buds. Mix the sprays according to label directions--various concentrates of the chemicals exist. Mix and apply fungicides to the swelling buds of the cherry tree to prevent brown rot or blossom blight to the trees. This spray application should be conducted just as the flower buds are beginning to break open. Follow the label directions for mixing and application. Inspect the cheery tree for any signs of blossom mold or young leaf problems. If required because of an extremely wet spring, another application of the fungicide may be warranted. Check the leaves of the cherry tree after the flower petals have fallen. Wet weather may cause leaf spot or powdery mildew to form on young leaves and green cherries. Mix and spray the fungicide to correct the mildew growth. In most cases, no more than three applications of fungicide should be administered to a tree in one growing season. Consult your local agricultural extension service for bulletins concerning various chemicals that will work in your location and climate. Some chemicals may be illegal to use in certain locations due to chemical over spray that may run off into aquatic areas. Keep children and animals from locations that have been sprayed with chemicals.